Discussion in 'Missing 1980 to 1989' started by Akoya, Sep 8, 2017. 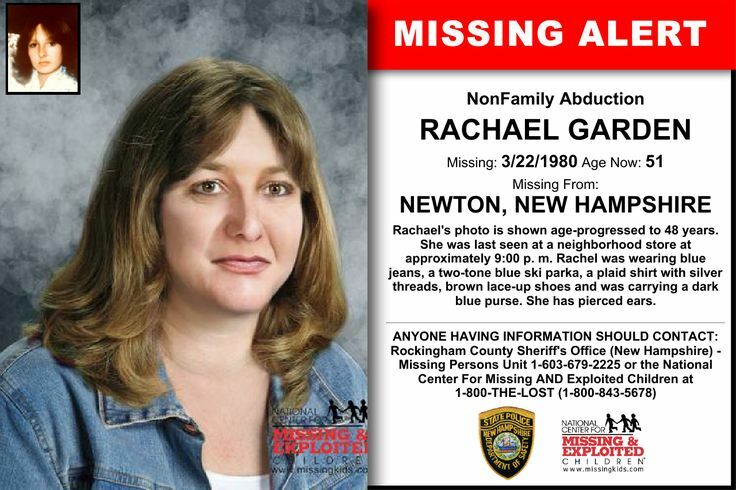 Rachael was last seen at a Rowes Corner Market on Route 108 in Newton, NH at approximately 9:00 pm on March 22, 1980. After she paid $5.00 for a pack of cigarettes she left the store heading north toward North Main Street. Garden was a regular customer at the store. She was a ninth-grade student at Sanborn Regional High at the time of her disappearance. She was the oldest of four children. In her free time, Rachael often walked the quarter-mile down to Rowe's Corner Market, looking for some excitement. Sometimes she went to the hill across from Maple Avenue, a place where local teens often congregated. Rachael's parents called the police station at about 10:00 am the next morning to report their child missing. Rachael's mother said that she knew right away something was seriously wrong when Rachael did not return to the family's small cape on Main Street. 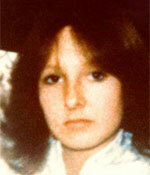 Rachael was considered a runaway by police in the first months after her disappearance. She was described as a headstrong and rebellious teenager, fun-seeking and outspoken. With a population barely over 3,000 people, Newton at the time, had only one full-time police officer. Over the years police investigators have checked numerous leads including possible sightings, talked with people who knew her, worked with psychics, used dogs and excavated sites looking for remains. Rachael left behind her horse, her dental retainer and other possessions. He parents have consulted psychics and hired private investigators to no avail. Years later at least two witnesses reported seeing Rachael talking to three young men in a dark car in the vicinity of Rowe's Market and Maple Avenue. Scorpio and spike like this. She was last seen at a neighborhood store at approximately 9:00 p.m. Rachel was wearing blue jeans, a two-tone blue ski parka, a plaid shirt with silver threads, brown lace-up shoes and was carrying a dark blue purse. She has pierced ears. The second and third images are age-progressed to 42 and 48 yrs. Distinguishing Marks/Features: Rachael has pierced ears. Dentals: Available. Rachael had orthodontic work, three fillings and her four "wisdom" teeth removed, prior to the orthodontic work. Clothing: Blue jeans, a two-tone blue ski parka, and a plaid shirt with silver threads. Additional Personal Items: Brown lace-up shoes, dark blue purse/tote bag with the word "Things" on its side. It has been more than 30 years since a 15-year-old from Newton disappeared, but police said they are continuing to receive tips in the case and are continuing their investigation. Investigators believe that Rachael Garden is dead, but her body has never been found. There have been many tips over the years, and several law enforcement agencies have been determined to solve the mystery and provide closure for her family. Newton Police Chief Larry Streeter said he recently received a new tip in the case, which he passed along to the State Police Cold Case Unit. "It isn't enough information that you can take it and run with it," he said. "It's just another small piece of information that may or may not fit in the big picture." Because it's an open investigation, Streeter said he couldn't comment on details. "I think the investigation is very much alive, and I think she is part of the chemistry of the community, and you just never forget," he said. "It's a small town. You never forget things like that." 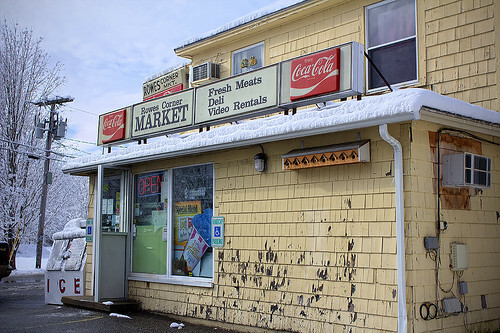 Rowe's Corner Market on Route 108 in Newton looks much the same as it did when Garden walked in to buy cigarettes and gum on the night of March 22, 1980. The 15-year-old was supposed to walk to a friend's house for the night, but she was never seen again. "It's been investigated through the years as a missing person, a possible homicide, and it has been an active investigation all along," Streeter said. Police have followed some leads, but no one has been charged. Her family moved away, her father has died, but the push for closure is ongoing. "We have had people that have had premonitions where we have looked through the woods and had dogs look," Streeter said. Several years ago, there was a search of Country Pond, and a $10,000 reward was offered. Garden would be 49 this December. It was the night of March 22, 1980 in Newton, New Hampshire. Rachael Garden walked into Rowe's Corner Market with her recognizable, easy smile. 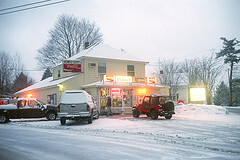 The shop's owner at the time, Peter Jewett, told The Seacoast Online in 2007 that he remembered Rachael was the type of girl to always say hello and flash her teeth. That night she bought a pack of cigarettes before reportedly heading to a friend's home nearby. Jewett told the paper he remembered watching her head out. "I turned and leaned against the counter like I always did to look at the road, and I saw Rachael walking towards Maple Avenue," he told the paper. But Rachael never made it to her friend's house. She never returned home either. Sometime that night, Rachael vanished. The next morning, her concerned parents reported their oldest child missing. The search for Rachael was slow. The tiny town's police force was equally small. Many simply assumed Rachael ran off, despite the fact that she didn't bring any of her dearest personal belonging with her. The high school freshman was attached to her family and there was nothing in her life that seemed to be nagging at her. One sinister theory did emerge. Someone spotted Rachael talking to three young men in a dark-colored vehicle near the market that night. Those in town said at the time in local newspaper reports, that the men had troubled reputations, but Rachael had been friendly with them in the past. None of them was ever charged in connection with the case, but that didn't stop rumors from swirling. It also became clear Rachael didn't have plans to sleep at a friend's home the night she disappeared. The friend later told police that wasn't the plan, although it wasn't abnormal for teens at the time to show up unannounced at their close friends' homes. Whatever happened that night, Rachael was never seen again. 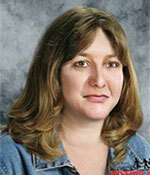 Her case remains open, authorities said, but few tips have been reported in the past few years. For now, whatever happened to Rachael on that March night remains a mystery. Anyone with information regarding Rachael's case is urged to call the Rockingham County Sheriff's Office at (603) 679-2225. A new tip could finally solve the 1980 disappearance of New Hampshire teen. 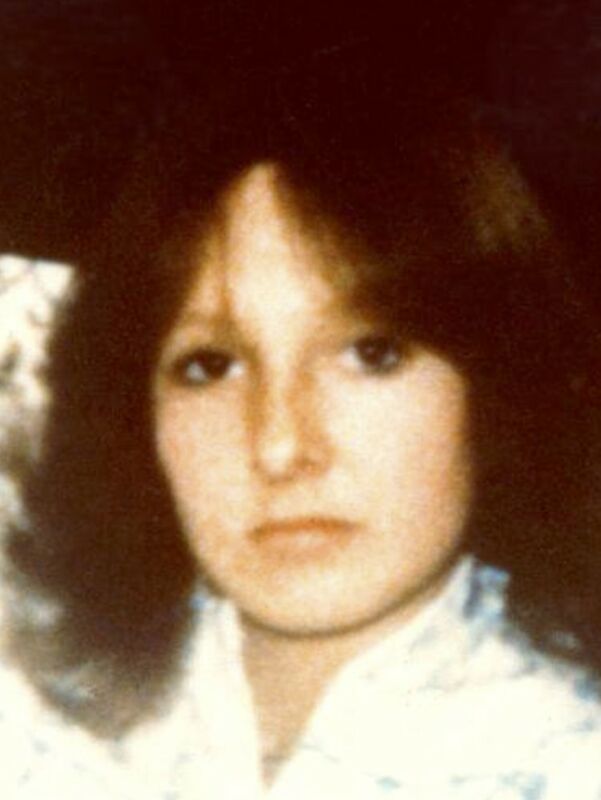 Rachael Garden disappeared in March 1980, after buying cigarettes and gum at a store in Newton, N.H. The then 15-year-old was supposed to meet friends but never showed up. The police chief in Newton just got a new tip in the case. The Eagle Tribune reported police have not said what the exact nature of the tip is, but said it could finally help put all the pieces together. Garden, who would now be 48, is believed to be dead. 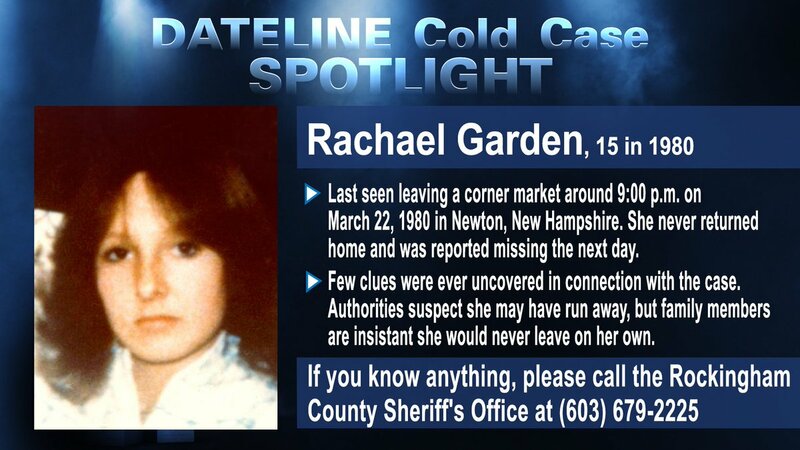 Details: Fifteen-year-old Rachael Garden was last seen on March 22, 1980, while walking home from Rowe's Corner Market on Pond Street in the town of Newton, NH. Rachael has not been heard from since. Extensive searches have been conducted for Rachel without any results. At the time of her disappearance, Rachael was wearing a two-tone blue ski parka, jeans, a plaid shirt with silver threads and brown lace-up shoes. She was also carrying a dark blue tote bag with the word "Things" printed on it. Circumstances surrounding her disappearance suggest that foul play was involved. NEWTON — A lot can change in 35 years, however nothing has changed for Rachael Garden. The New Hampshire girl is still missing, as she has been since March 21, 1980. Despite last being seen decades go, police are still investigating her mysterious disappearance. "We've actually had discussions within the last month about developments in the investigation," Senior Assistant Attorney General Ben Agati said about Garden's case. Garden's mother, who has since moved, declined to comment. Garden is one of an estimated 120 active missing persons cases in New Hampshire, Agati said. The state's Cold Case Unit, which falls under the state Attorney General's office, was established in 2009. Now, two full-time state police troopers and one part-time investigator are wading their way through the list. State investigators are also coordinating with Newton police and the Rockingham County Sheriff's Office, Agati said. Kingston police have also been involved in the case throughout the years. Agati said every tip and lead is being investigated, and they're still coming in. Investigators have "actively researched new leads within the last three months," he said. He declined go into detail on what those involve. Some details are already known. Garden, who was 15 at the time, was wearing blue jeans, a two-tone blue ski jacket, a plaid shirt and brown shoes and was carrying a dark blue purse. The Sanborn Regional High School freshmen had light brown hair and hazel eyes; she was 5-foot-1 and weighed about 100 pounds. After she bought a pack of cigarettes and gum at Rowe's Corner Market on Route 108, she was last seen around 9 p.m.
Garden, the eldest of four children, was supposed to meet some friends at a Main Street residence but never arrived there. Police did not believe she was a runaway because she left behind her horse and her dental retainer and other possessions, a state police detective said about 12 years ago. 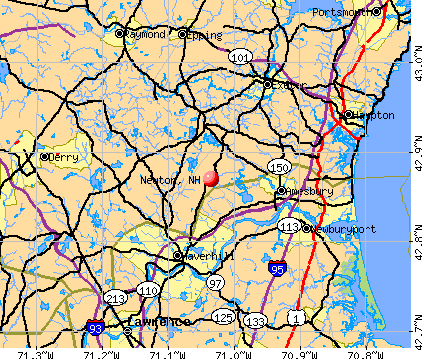 After her initial disappearance, Newton residents and police searched for Garden all over town. In the early 1990s, the state police major crime unit and others excavated a 60-square-foot patch of woods in town. Around the same time, Garden's parents contacted psychics in an effort to find their daughter. Efforts to find Garden have swelled throughout the years. In 2008, investigators scoured Ice Pond and Country Pond for clues after receiving a tip, but nothing was found. More than six hours were spent using sonar and Global Positioning System equipment to look at the bottom of Ice Pond. Newton Police Chief Lawrence Streeter previously said a new tip is submitted and investigated about every six months. If Garden is still alive, she would be 50-years-old, Agati couldn't say for certain if she is likely still alive. "I don't think we have enough facts to be able to say that one way or the other," he said. Given the new forensic technology — and hopes more people will come forward with information — there is still hope to solve the case, Agati said. In December, the cold case unit helped solve the murder of Judith Whitley, a Massachusetts woman who was killed in Winchester, N.H., in 1987. "We do see progress on these cases," Agati said. Anyone with information on Garden's disappearance is asked to call the National Center for missing and Exploited Children at 1-800-843-5678, or the Rockingham County Sheriff's Office at 679-2225. Scorpio and Akoya like this.